After the last painting which included the silver pitcher, I decided to do another study to reinforce what I had learned about silver. 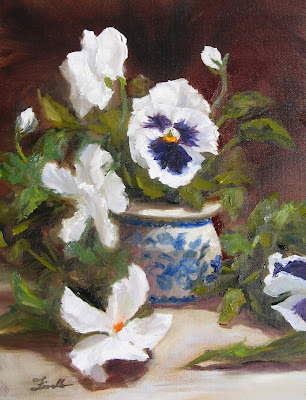 I set up the pitcher at a different angle in a different light for this smaller study. Working on depicting silver last week. It's easy to get too hard edged and literal on the reflections which I did at first, then had to scrape off the paint and start again. Basically I learned that the approach is similar to a ceramic vessel, get the big light and shadows first to capture the form and dimensionality, then add the reflections on much as you would add decoration or pattern on a ceramic vase. Form first, surface decoration ( in this case reflections) later. I'll try to remember that. I spent last week studying with Robert Johnson, so back to still life for a few days. This was a scene looking down on Lake Orta in Northern Italy. I had done a similar scene in watercolor several years ago and decided to give it a try in oils with an aim of getting a sense of depth. I decided to go with a long rectangular canvas for a more panoramic effect to emphasize the breadth of the lake and mountains. Lake Orta is one of 5 lakes in the lake region of northern Italy. September 21-28, 2013, I'll be taking a group of painters to be inspired and paint on location at another of the lakes, Lake Garda. If you are interested and would like more information, see Lake Garda for a flyer with the details. There are still a few spots left and the program is open to artists of all experience levels and all mediums. Here are a few scenes from my last trip there to give you an idea of the beautiful views and subjects to paint. If you would like to join us, click on Register Now- I'm going to Italy! This was a second study we did in class. After the 1/2 hour study, we now had a challenge of 20 minutes to get the essence of the next scene down on canvas. This was a study I did in class yesterday. The challenge was that we had a timer set to go off after only 30 minutes. Given the time constraint, you really had to go for what's important, the big shapes and values first. Good exercise in prioritizing and not fussing over details, but I'm glad I don't paint with a deadline every day. it was a bit nerve wracking, especially hearing the ticking! My instructor's suggestion was that this was a good way to approach paintings to do a small study first to see if it even had potential to go larger before investing a lot of time and supplies in something that didn't have a lot of potential. This is a Villa that I stayed at during one of my first trips to Tuscany back in 2001. I had done this scene in watercolor while painting there on location and decided to give it a try in oils. It's fun to revisit and old subject and try it in a new way or in this case with a new medium. This week my regular painting classes resume, but this past weekend I taught my first workshop of the year. About 15 years ago I developed and started teaching the "Art for Non-Artists" workshop. I designed it specifically for total beginners. I meet many adults who would love to try their hand at art, but believe they are not artistic because of something that may have stopped them. Often we give up somewhere in elementary school then continue to believe we don't have what it takes. But truly everyone can learn to paint if they are given some direction and practice. I especially like to teach beginners because it opens the door to a whole new world of art and seeing the beauty of the world for them. Something they didn't think was possible is now available to enrich their lives. Below is a photo from the end of the one day workshop I taught on Saturday. A past student of mine, Robin, came back again to share the workshop with her niece Susanne. A very special way to spend a day of fun and learning together! I took the 8 x 10 study of the waterfall from the other day (posted on 1/8/13) and decided to translate it up to a much larger format and change it to a vertical orientation just for the challenge of a different composition. I did this painting in 2012, but when I went to mark it SOLD that I realized had neglected to post it. A past collector purchased it for his wife as a Christmas gift and I was happy to hear she loved it and hung it up the day she received it. Creating art can put you in a state of joy, but it is also a good feeling that your painting can bring a smile or uplift another's spirits too. One of my goals for this year is to work on more and larger landscapes. I began with this study of a waterfall scene. 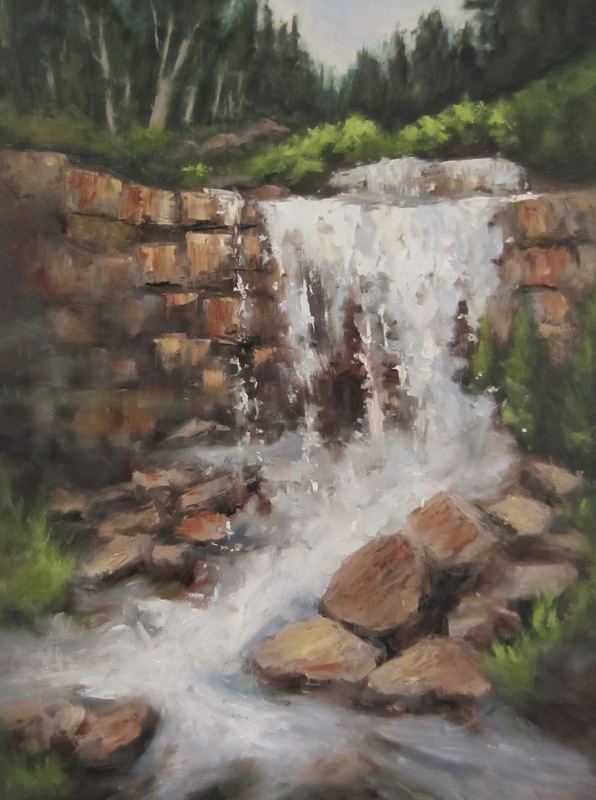 I have never done a waterfall painting in oils so was a bit intimidated at first but was happily surprised with the results and particularly liked the feeling of movement of the water. The stones were fun to do with lots of thick paint and a palette knife. Now that I have a sense of how to approach this subject I am going to scale it up to a larger format. Will share that once it's done. Happy New Year! This is my first painting of the new year. Have to admit I'm off to a slow start in 2013. Still getting over laryngitis that I've had since Christmas and not much in the mood to do anything. To get myself started again after the holiday break, I approached a subject I'd done before but wanted to try it with a different color scheme and palette. Here's the original photo to see how I've taken the spirit of it, but altered the colors and even changed soem of the stonework on the door. My art goals for 2013 include painting more landscapes including some larger formats ( bigger than 16 x 20), continuing to develop my oil painting skills (brushwork, developing mastery in capturing dramatic light and shadow) and publishing a book of my painting of Italy. I'm also excited to be taking a workshop for my own learning in France in May and leading another workshop in beautiful Lake Garda in Northern Italy in September. A lot to look forward to. I'll be sharing my progress along the way. I'm declaring 2013 a year of Celebration and Growth! What are you creating for 2013?